In this study, reduced graphene oxide (RGO) was synthesized by L-ascorbic acid reduction, which was a relatively mild and environmental friendly reduction method, and the adsorption of organic contaminants was compared to graphene oxide (GO) to probe the potential adsorption mechanisms. The morphology properties of GO and RGO were characterized by X-ray photoelectron spectroscopy (XPS), Fourier transform infrared transmission (FTIR), Raman spectrometer, transmission electron microscope (TEM), and scanning electron microscopy (SEM). The adsorption affinities of GO and RGO for phenanthrene and 1-naphthol were studied in batch experiments. The effects of pH and surfactants were also assessed. The results demonstrated that RGO reduced by L-ascorbic acid show significantly greater adsorption affinity for both phenanthrene and 1-naphthol than GO, and even greater than most of RGOs that reduced by the strong reductive reagents. This was mainly attributed to the hydrophobic interaction, π–π interaction, and H-bonding between graphene sheets and organic contaminants. Both GO and RGO showed stronger adsorption to phenanthrene than to 1-naphthol. The adsorption of 1-naphthol increased with decreasing pH and reached a maximum around pH = 7.34. The surfactants, sodium dodecyl benzene sulfaonate (SDBS) and cetyltrimethyl ammonium bromide (CTAB), had negligible influence on adsorption to GO. Note that CTAB significantly inhibited the adsorption of phenanthrene/1-naphthol on RGO, which could be attributed to the pore blockage effect. In addition, RGO could be regenerated and reused with high recyclability over five cycles. The present study suggests that RGO obtained via L-ascorbic acid reduction can be deemed as a promising material for organic contaminated wastewater treatment. The online version of this article ( https://doi.org/10.1007/s11356-019-04549-9) contains supplementary material, which is available to authorized users. 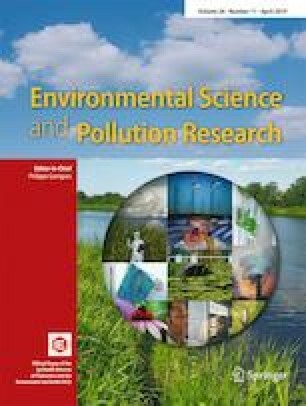 This work was financially supported by the National Natural Science Foundation of China (Grant 21707101), the Science and Technology Development Foundation of Tianjin Municipal Education Commission of China (Grant JW1715), the Opening Foundation of Ministry of Education Key Laboratory of Pollution Processes and Environmental Criteria (Grant 2017-06), the Doctoral Found of Tianjin Normal University (Grant 52XB1403), and the Innovation Team Training Plan of the Tianjin Education Committee (TD13-5073).